Defense Minister Liberman says security policy is responsible, does not answer to headlines, public opinion. 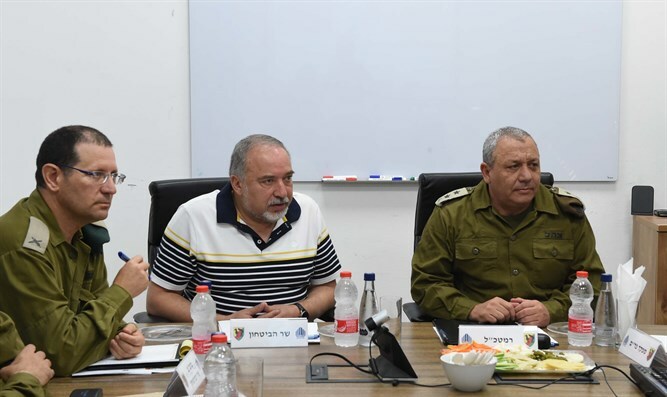 Defense Minister Avigdor Liberman (Yisrael Beytenu) on Monday morning held a discussion with IDF Chief of Staff Gadi Eizenkot, Southern Command Commander Maj. Gen. Herzi Halevi, a Shabak representative, and others. At the end of the meeting, Liberman said, "First of all, I want to thank the determined commanders and soldiers, who are infused with the spirit of battle and do holy work for the sake of ensuring the security of Israel's citizens." "Since the 'March of Return' events began, Hamas has suffered 168 deaths, and 4,348 have been injured. Dozens of terror targets have been destroyed. "The question of the next round is not a question of 'if' but of 'when.' I am sure that we will do what is necessary, the way it needs to be done." Regarding public opinion, Liberman emphasized, "We have a responsible and powerful security policy. A responsible security policy does not answer commenters, newspaper headlines, or public opinion. We are prepared and we know what to do and how to do it."